Generally I love all of the projects I share here (why else would I bother? )…but this one I really love. 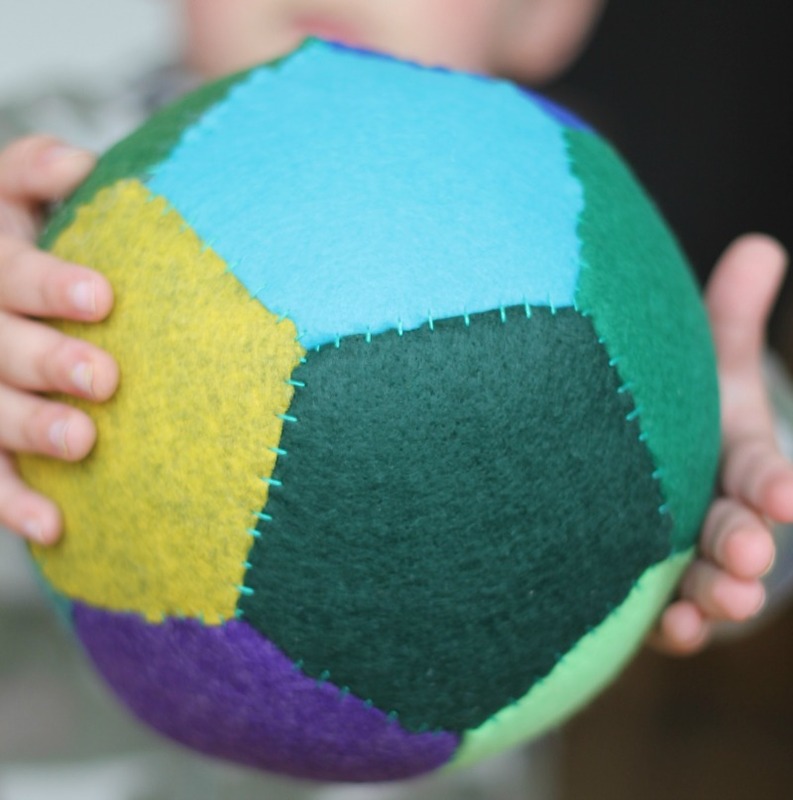 I love this DIY felt soccer ball because they are awesome and my kids LOVE them. Really. 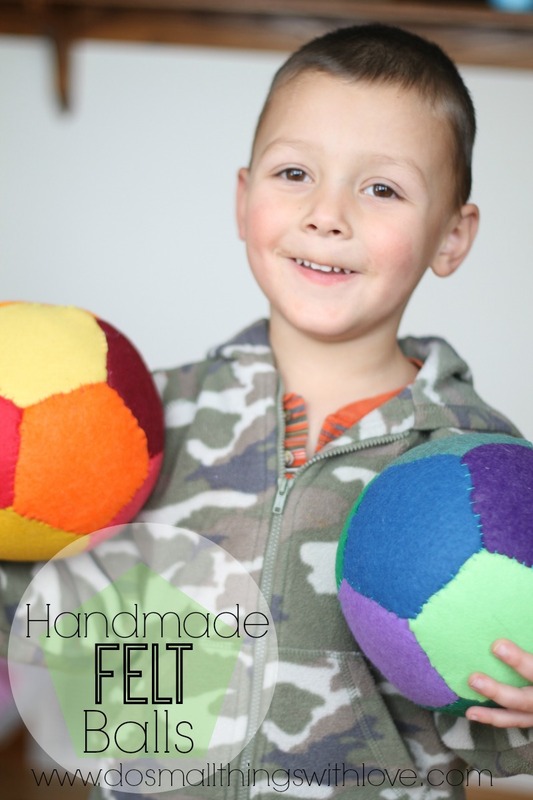 I mean, it’s no surprise that kids would like to play with a ball, but these DIY Felt Soccer balls are soft, they bounce a little, they are the perfect size for a kid to play with and they are so fun and colorful. I love them. And, making them allowed me to dust off and use some of those old math skills that I hadn’t bothered to think about for a long time. Really, all this project is is a bunch of geometry (wait, don’t leave–it’s easy and you don’t need a calculator!!). 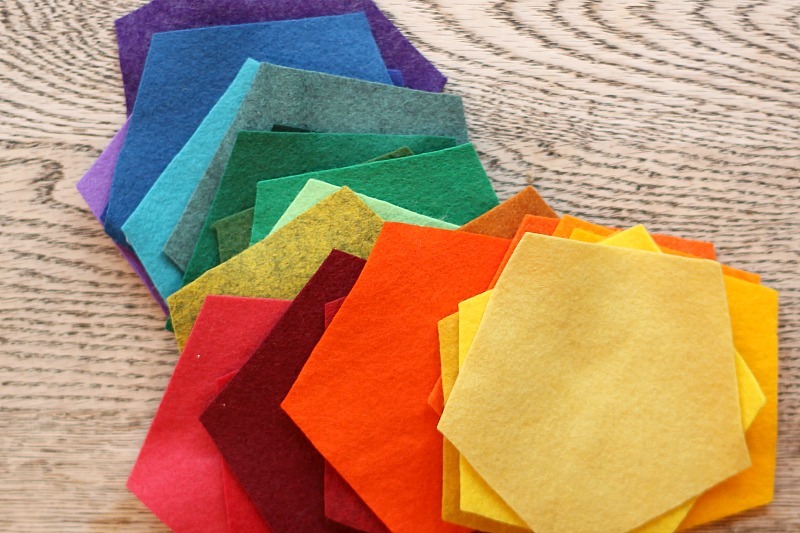 Just grab all of your colorful, wonderful felt and cut out 12 pentagons. Because these balls will be used and loved and kicked I recommend using a wool or wool blend felt, as it will last longer. I get my felt from BenzieDesign. You can cut your pentagons at any size (as along as they are all the same size). I have supplied a very simple pattern below. Resize as you see fit. Once you have your pentagons cut, it’s time to get sewing! So, this is where it gets a little tricky. You can sew your pentagons together by hand, or you can use the sewing machine. I sewed mine on the machine with a hefty zigzag to keep the pieces together. To ensure that the ball is put together correctly here is how I recommend putting it together. Divide the pentagons into 2 groups of 6. Lay them out so that one is in the center, with 5 around it as picture below. As a first step, sew along all 5 sides of the center pentagon, making sure the seams are all on the same size. Do this for each group of 6 pentagons. As a step 2, refer to the image below. Pull together the two sides of the pentagons and sew, once again making sure the seams are on the same side. The result will look like a bowl. Once you have constructed a “Bowl” out of each group of 6 pentagons, then it is time to put the two together! The two sides will fit together, the point of one pentagon fitting perfectly between the sides of 2 other pentagons. Sew all of the sides, leaving 1 open so that you can flip the ball, and stuff with poly fil. Note here–I would encourage you to OVERFILL the ball. With play and use the poly fil will compress. Cram as much poly fill in there as you can!!! And finally, hand sew shut the opening. Make sure to sew it securely! As you can see in the image below, I used a zigzag so when I flipped it you can see the vertical stitches. If you don’t like this, use a standard straight stitch. Also, since I used a zigzag I didn’t have much, if any of a seam allowance. If you use a standard stitch, cut your pieces bigger as you will need to leave a larger seam allowance. I am just so happy that I made something the kids like to play with. Since the balls are filled with poly fil they can double as a pillow and my son has taken his now beloved ball to bed with him a few times. Like I said, the balls bounce a little and are perfect for learning to play catch–they are so soft. And, since we are looking at spending a lot of time inside (I can’t believe how much snow we already have…and how cold it is!!!) these balls are perfect for indoor play. They can be kicked and thrown with little worry. And there you have it. 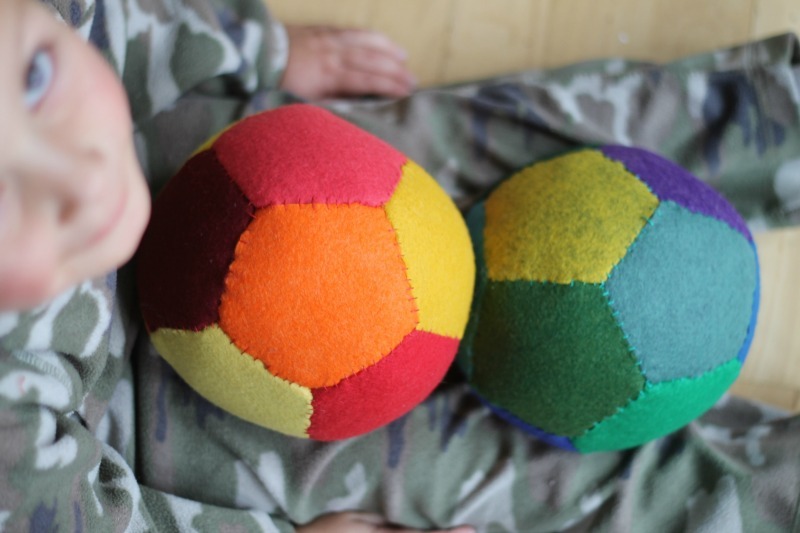 See, you really can do anything with felt…including make a ball! I will try it but don’t know it can make the cute like you or not. I hand stitched mine, but a tight zig zag would work too. It’s off to the baby shower today. The hardest part was putting the two sides together (the corners) and closing the last side up after stuffing the ball. I will need to practice that!